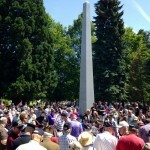 Portland, OR—When Oregon Memorials heard that a group from Madison High wanted to place a memorial for Gus Waterford, they sprang into action. OM got word of the students’ noble project through OregonLive.com (read more of the story). 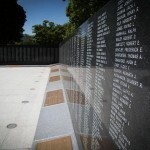 The monument features the patented GLASS Art® technology on Elite White granite. 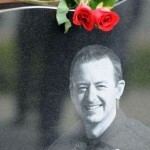 January 15, 2015 — Galt, CA — A memorial designed by OM Stone was unveiled Thursday to honor two officers killed in the line of duty. 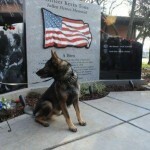 Hundreds have already visited the memorial. 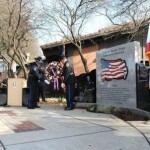 Click here for the news video and here for the news article. 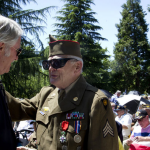 June 6, 2014 — Salem, OR — Oregon’s first and only memorial honoring its World War II veterans, who gave the ultimate sacrifice, was dedicated today at the grounds of the Salem capitol building. 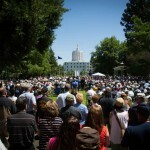 More than 2,000 attended the beautiful ceremony which included an address by governor Kitzhaber. Click here for a full story. 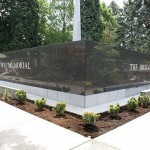 Hillsboro, OR—OM’s new Space Saver columbaria might just be your solution for increased revenue and profit. They are fully customizable and bring art into the experience. Inexpensive to provide, beautiful to behold. Call us (800-787-7866) for more information. 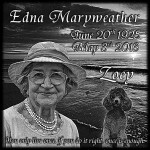 What do you do when families take the ashes home? 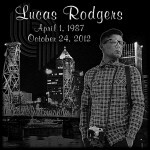 Hillsboro, OR—Oregon Memorials’ 6″x6″ Memory Tile gives customers a fantastic option for cremation memorabilia. Read more here. 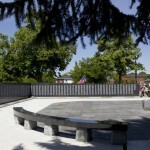 Salem, OR—Oregon Memorials supports the Oregon World War II Memorial coming to the capitol grounds in Salem. Go to the website and get involved in this fantastic project! Seattle, WA—Oregon Memorials’ GLASS Art® of Our Lady of Sorrows was featured in the Catholic Cemetery Conference magazine. Click here for the story. 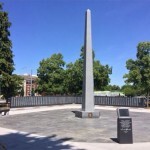 Bend, OR—Oregon Memorials is very proud to have its own Bernie Venter featured in a short video segment from KTVZ – Bend, Oregon. 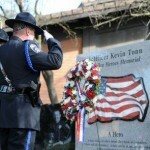 In this sigment Bernie adds Justin Wilkens’ name to the Bend Heroes Memorial Wall. You can watch it here. 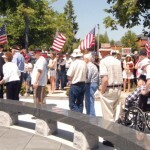 San Diego, CA—Once again the Monument Builders of North America has awarded Oregon Memorials for excellence in memorial design. Awarded only once every two years, the MBNA recognizes monument builders across North America for their innovation. 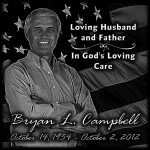 Read the press release here. 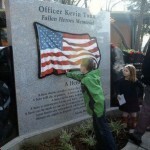 Portland, OR—KGW featured Oregon Memorials’ revolutionary new product, BronzStone, after a local man had his grandfather’s bronze memorial stolen. 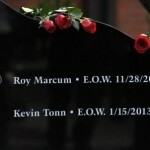 Watch how this patented BronzStone memorial process illustrates the future of memorialization.